Here we have yet another item given to the museum this month. This one belonged to Tom Gye who died last year. It was one of his top hats. A part of the Gye business was undertaking funerals. We already had the frock coat and trousers Tom wore when on this job. We can now add the hat to the display on the upstairs settle in the museum. The hat is in a rather careworn hat box. Careworn hat box but it has served its purpose and kept the hat well. The hat inside, however, is just fine. The hat carries the mark of Henry Heath – established in the reign of George 4th and by warrant to His Majesty the King. This must date the hat to the first half of the 20th century. The Henry Heath name is also embossed on the hat lining. The box carries an order and hat number. That’s order number 5168 and hat number 8307. Maybe an expert out there could fix the date of the hat from this. This document is not specific to Market Lavington but refers to the whole of Wiltshire and other counties. The Wiltshire wage is compared with the highest and lowest wages paid elsewhere at various times in the 18th, 19th and 20th century. We can see that the Wiltshire farm labourer was amongst the lowest paid getting something akin to just two thirds of the best paid and sometimes little more than half. Let’s take that 1892 figure of 10 shillings per week (which is equal to 50p in decimal money). Changes in value are difficult to calculate but goods that cost ten shillings in 1892 would cost about £50 now. In fact a present day farm worker probably earns £300 a week and would still be classed as low paid. It gives an idea of how impoverished our Victorian labourers actually were. This piece of writing, we believe by Janette Hodgkinson, was written in 1999 and follows the archaeological excavations on the Grove Farm site. We think it captures the spirit of two ages, separated by a millennium. We are two women separated by a millennium. You were brought back to the surface of our village by an archaeologist at the beginning of the 1990s. I washed the sandy soil from your skull and found the pale blue, barrel shaped, Roman bead that was one of your treasures. Maybe a gift from your mother or grandmother, precious enough for you to make into a necklace with other more modern beads and for your family to place it around your neck when you were buried. This is my village now as it once was yours. We tread the same pathways, scan the same skyline and are warmed by the same sun as it rises over the vast Wiltshire Plain. I know a little of your hard Anglo Saxon life, but you, even in your wildest dreams could never imagine the wonders of mine as I face the end of our joint millennium. Your family hunted in the woods and fields that are part of the village surround, I travel to buildings where exotic foods are brought from the other side of the planet for me to choose from. Maybe some of your family died because there was too little to eat, some of my family have died because there has been too much. You collected fuel from the nearby woods on which to cook your food and bake your bread. I have smart little boxes that keep my food fresh, cook it to perfection and at the press of a button bake my daily bread. Did you walk the local fields gathering herbs to cure the ills of your family? I have hospitals and doctors to fight for my life. Yes, we still fight to stay healthy but ironically in a lifestyle totally the opposite to yours. Like me, perhaps you weren’t born in the village, did we both travel to be part of its history? You could have journeyed many days to see your family and friends just once or twice in the whole of your lifetime here. I spend merely hours covering the hundreds of miles to see my mine, with the use of the phone and e-mail I talk to some of them every day. I’ve flown through the air to be with them on the other side of the Earth, with the same excitement you could have felt visiting the growing settlement of Sarum. I hope you had a grandchild and experienced the joy of seeing the future though it’s eyes. Did it stand on the edge of the Plain looking down at our developing village in wonder? It’s possible mine will stand on the flight deck of a spaceship and look at the beautiful planet we have both been part of. Our lives have been so different, yet our hopes and fears would have been the same. One day, like you, I will be part of the soil of Wiltshire and rest not twenty yards from where you were found. John Davis was a coal merchant in Market Lavington at the time when coal was king. If you wanted to keep warm or cook things then the chances are you used coal. Huge quantities were moved around the country, mostly by rail. Some merchants had their own dedicated wagons and although no actual wagons survive, a model company produced a kit of a Davis of Lavington wagon. We have seen this photo before on this blog which shows a made up wagon, ready to run on an OO gauge model railway. We also have a nearly identical wagon in unmade kit form. It looks as though Davis had at least seven wagons for this is number 7 whereas the made up kit is number 5! The kit looks as fiddly as these things often are, but also has some information with it. Our decision is to leave this one in kit form as we have the made up model. Our luck is that a company decided to make a model with a Market Lavington connection. What commonplace items these are. In times past every church had sets of numbers which could be slotted into a board to tell the congregation which hymns were to be sung. These days more and more churches are changing their technology and using projectors to indicate hymn numbers or to project words – in which case no number is needed. When Trinity Church moved from the former Congregational Church and into the Community Hall, their old number cards were no longer needed and they came to the museum. These double sided cards are obviously well worn. They carry no manufacturer’s mark so it is impossible to put an age to them but long serving church members don’t remember a time without them. For those that want to know hymn 478 is “How firm a foundation, ye saints of the Lord”, 130 is “God is gone up on high” and 259 is “Sweet Saviour! Bless us ere we go”. There was a time when men shaved themselves with cut throat razors. That’s a fearsome sounding name for what was a very dangerous tool. To get a perfect edge on a cut throat razor, it was essential to sharpen it each day and the final stage of sharpening was to run the blade up and down a leather ‘strop’. That’s our strop, at Market Lavington Museum, alongside this information. To strop your blade you’d hold the tail end of the leather strop and push the blade back and forth with the sharp edge always trailing. It was, of course, perfectly possible to get a finish that was sharp enough to shave with. Our strop, we can see is called ‘The Scorcher, number A289 and it claims to be genuine shell horse. Apparently this form of leather was deemed high quality in the world of strops. We think the strop dates from around the 1920s or 30s. We know it belonged to the Gale family who lived on the Spring in Market Lavington. 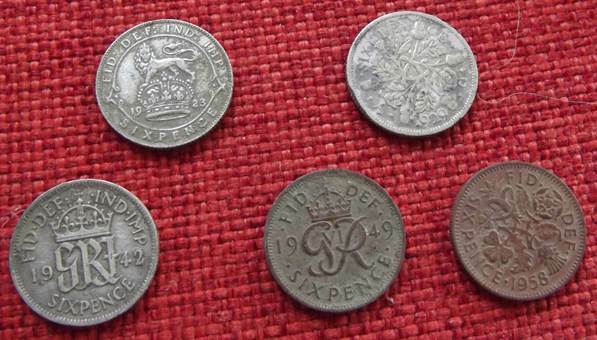 Our local metal detectorist found quite a few pre 1971 sixpence coins or tanners as they were affectionately known as. They all come from the old recreation ground. Here’s a sample to show changes. These coins were known as ‘silver’ unlike the penny and ha’penny which were ‘coppers’. In times past they were probably made of silver metal but silver content was gradually reduced over the years. The oldest coin there, the one at top left, dates from 1923 and features a lion and crown on the reverse side which we show here. It has retained its silver colour so will have some silver content. The second coin at top right dates from 1929 and still has silver. It has an oak leaf and acorn pattern on the back. These coins are fifty percent silver. In the front row we start with a 1942 coin. This is still a 50% silver coin but by 1949, the next coin, all silver content had gone. The coin, like the last one form 1958 is cupro-nickel and both have tarnished in the ground. The 1958 coin shows the plant emblems of England, Northern Ireland, Scotland and Wales. None of these coins have much cash value but they had actual value back then. A person who earned sixpence in 1958 would earn about £1.54 now – an annoying amount to lose. In connection with other finds they start to paint a picture of the way the old recreation ground was used. It was certainly a place where money changed hands and got lost as well. 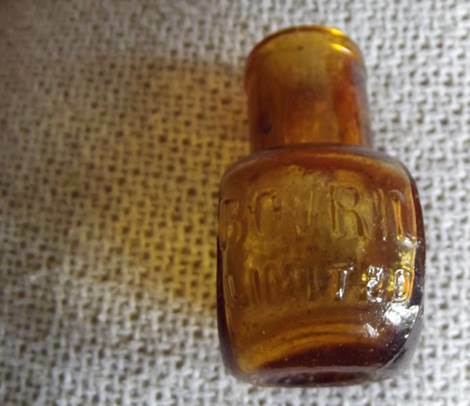 OK, glass Bovril jars are almost as common as muck but we are still pleased to have one at the museum. It was acquired at a day centre sale earlier this month. It’s a small one. These jars were factory made in a variety of sizes. 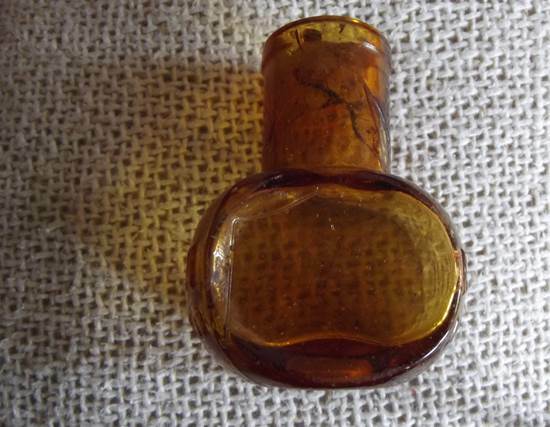 We believe this one was a two ounce jar. Our Bovril jar is the same as many, many others. The shape is distinctive, with the long neck and the flat sides. It is the curved ends that have embossed writing. One thing we are not sure about is what kind of lid these jars had. We assume it was some kind of ‘prize off’ metal lid. There’s certainly no thread for a screw on lid. The bottle could be 100 years old but may well be newer than that. We open for the new season on Saturday May 2nd at 2.30 pm. This little jar will be on the new acquisitions shelf in the upstairs room. From May to the end of October on Saturday, Sunday, Wednesday and bank holiday afternoons from 2.30 to 4.30 pm. For group visits or opening at other times please contact the curator. Visitors should park in the Community Car Park and walk up the path to the church. The path behind the church leads to the museum. During much of the second half of the nineteenth century Edward Box owned the local brickworks but after his untimely death the business was sold to Holloway brothers, a West Lavington based family. Production at the brickworks continued much as before. 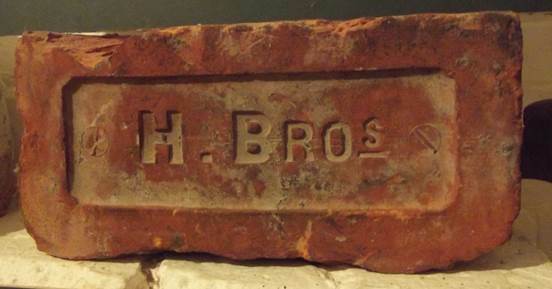 We have several examples of bricks and tiles bearing the Box mark but here we have a brick embossed with H. Bros in its rectangular and flat frog. H. Bros means, of course, Holloway Brothers. This brick dates from the early years of the 20th century and its wear and tear does suggest it was rather a soft brick and that seems to have been a feature of bricks made at the Lavington works.